In an article with a cheeky title and a noble purpose, Raymond J. Dowd, Partner with Dunnington Bartholow & Miller LLP argues that the procedural or “technical” defenses, such as the statute of limitation or laches, should not be available in disputes involving art looted during World War II. He specifically targets art works of European provenance that entered the United States after 1932 and were created before 1946. Statute of limitations imposes a term limit to bring a claim for a specific cause of action, here replevin or conversion (money for the stolen object or recovery of the object itself). Laches is a defense for defendants who may be prejudiced by plaintiff’s efforts to recover, in this instance stolen or lost art. Over the last decade, museums and collectors have been turning to technical defenses to avoid reviewing facts surrounding ownership of art displaced during World War II. 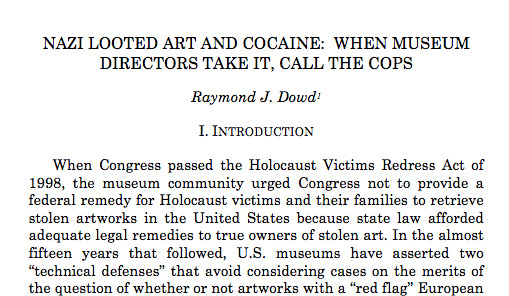 A PDF of Dowd’s “Nazi Looted Art and Cocaine: When Museum Directors Take it, Call the Cops is available from Rutgers J. Law & Religion.